Gohd is an utterly worthless browser add-on that should be removed immediately. In fact, Gohd is just one more adware program that will make your life miserable, to put it mildly. Numerous annoying third-party adverts and annoying pop-ups are the most prominent feature that Gohd exhibits. If you have actually noticed this behavior, you should check your system for this questionable program as soon as possible. Do not under any circumstances trust Gohd, as it could have devastating outcomes. We have prepared a detailed removal guide to help you remove Gohd in no time. Read the rest of this article and find out why exactly the removal of this intrusive adware is so important. Since there is no official website of Gohd, it is quite natural that this adware program is distributed via various software bundles. These are acquired on questionable third-party download websites or websites associated with online piracy. In order to reduce the risk of getting your PC infected in this manner, you should download your software from official websites only. In addition to that, we strongly advise you to install a professional antimalware tool as it provides overall security for your system at all times. Just like many other adware programs, Gohd depends on browser extension to show ads while you are browsing the web. Browsers such as Google Chrome, Internet Explorer, and Mozilla Firefox are all affected by this invasive adware program. It is important to note that the names of the extensions inserted by this adware program could be randomized. For instance, you could come across names such as GoHDv7.2.1, GoHD 1.2, GoHD+3.1, or others. The change of names is used to fool unsuspecting users. 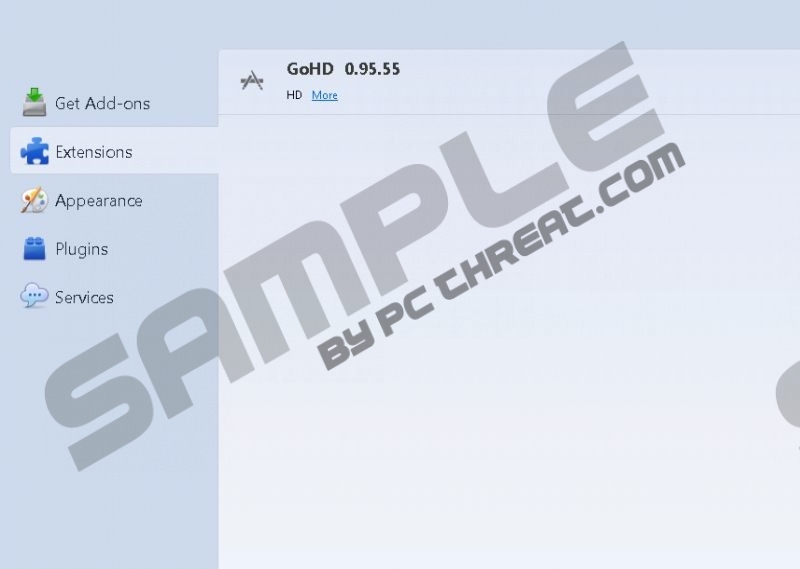 If you come across anything that resembles Gohd, you should know that it is an add-on, which you should not keep on your PC. Since it is known that all the ads presented by Gohd are provided by adware serves, which are infamous for being linked to malware distribution, it is quite natural that we strongly recommend not clicking on any of the ads, as your system could be infected with other unknown malware. Remove Gohd as soon as possible, as this is your best bet to regain the normal functionality of your browser. Unfortunately, some users might find manual removal and the recommended analysis for potential leftovers too complicated. If you are one of those users and wish to remove Gohd completely, please use a reliable antimalware tool. This will not only delete Gohd entirely, but it will also provide you with overall system security at all times. Quick & tested solution for Gohd removal.